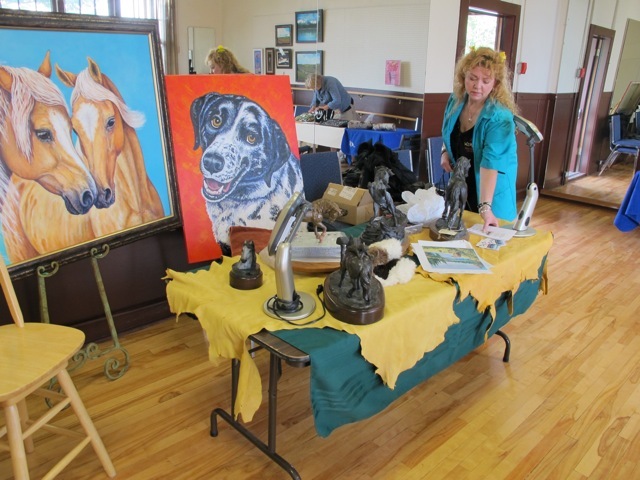 If it’s April, it must be time for the Chinook Creative Arts Foundation’s annual show and sale in Water Valley, Alberta. The show runs Saturday April 25 from 10 to 4 pm. This show is one of my favourite events. The small rural community is a strong supporter of the arts. The show features numerous regional artists working in various media and attracts an audience from several nearby towns and cities including Cochrane and Calgary. There will be artists and artisans, local musicians and, of course, the famous homemade soups and pies. I’ll have beadwork along with some of the wire and metal pieces I’ve been working on this past winter. Categories: Events | Tags: art show, artists, Chinook Creative Arts Foundation, Water Valley AB | Permalink. Once a Catholic Church, the building had been decommissioned in 2001 and was slowly falling into disrepair. A local couple bought it and began to lovingly restore it. Kristine Sarsons, an artist and one of the owners, organized the art show. She also arranged for several local musicians to entertain during the event. There was a potluck lunch for the artists and the music makers — a welcome break during a busy day. The art show coincided with the annual Water Valley Days — complete with a pancake breakfast, a parade, chili cookoff, a BBQ and lots of family activities. Categories: Events | Tags: art show, artists, parade, Water Valley Church Events Centre | Permalink. It’s that time again! The Airdrie Food Bank is celebrating its 8th annual Empty Bowls Arts Festival. This community-wide event began in 2007 and has grown in popularity each year. The week-long activities culminate on Saturday June 21 with the Arts Festival from 11 to 5, rain or shine. It all happens at Nose Creek Park. You’ll be able to buy local art, meet the artists, watch demonstrations, listen to music and bid on an array of art in the silent auction. You’ll also be able to enjoy a free soup lunch. Bowls are available for a suggested donation of $20. Categories: Events | Tags: art auction, art show, artists | Permalink. Well, I’m back in the saddle again. Okay, maybe not a real saddle, but I am kicking off the 2014 show season — beginning tomorrow with the annual Art Show at Water Valley, Alberta. Check for more information at the Chinook Creative Arts Foundation. Categories: Events | Tags: art show, artists, Chinook Creative Arts Foundation | Permalink. Airdrie’s ARTember kicked off last Friday with the 3rd annual Art Show & Sale in the large showroom at Cam Clark Ford. Nearly 30 artists had work for sale — painting, photography, wood turning, jewelry, bronze sculpture, wood carving and more. All the artists are members of ARTS (Airdrie Regional ARTS Society). Here are a few who caught my eye. Darryl Bernsten has been taking photographs for a long time but only recently begun to show his work professionally. His photo titled “Wheat” shows amazing detail. John Smythe is a wood turner. His turned and decorated “Butterfly” vase won first place in the Woodturning Section of the 2013 Calgary Stampede Western Showcase. The judges also awarded it “Best of Show” for all woodworking entries. Rick Berg has been painting for about 25 years and is best known for his wildlife and landscape work, like this piece titled “Mt. Assiniboine”. Ken Vicketts is a wood carver. This pair of gannets won Best of Show in the Wildlife category at the Pacific Brant Carving and Art Show. Diane M. Anderson has been working in bronze for about 35 years. This piece, titled “Quittin’ Time”, was bought by a collector at the show. Categories: Events | Tags: art show, ARTember, artists | Permalink. Airdrie is doing it again. Beginning September 13 the city is hosting 2 weeks of arts and culture to celebrate Alberta’s creative spirit, turning September into ARTember. 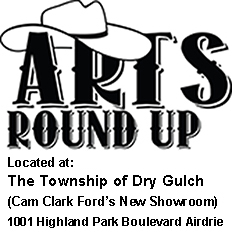 Part of the celebration is a wonderful art show and sale taking place September 13 and 14 in the showroom at Cam Clark Ford in Airdrie. This is the third year for this event and each year it gets better. You can check out some of the artists who will be appearing there (including me 😉 ) on Facebook. Categories: Events | Tags: Airdrie Regional Arts Society, art show, ARTember, artists | Permalink. At first I thought he was joking but the man standing in my booth at the show this past weekend was serious. He and his adult son had looked at all the earrings on my table and then his eyes settled on the ones I was wearing. “Did you make those?” he asked. “Well they’re the ones I want.” He was buying a present for a woman in his life and those were the earrings he wanted. He continued looking. “I’d also like to buy these too.” He added a second pair to his purchase. He said it all with an easy manner and a big smile on his face. How could I say no? “Okay!” I laughed at his persistence. I brought out my pliers, removed the clips from the earrings and put on new hooks. I wrapped each pair, he paid me and the deal was done. He and his son walked away with 3 pairs of earrings and I made a sale I won’t soon forget. Categories: Events | Tags: art show, Otter Pottery | Permalink. Wellspring’s 7th annual ArtWalk kicks off this week and that means a summer full of wonderful art in more than 30 venues across Central Alberta. This summer my work will be featured in Side Street Fashion & Accessories in Uptowne Olds, AB. I’m delighted to be there. The staff have been so welcoming and have provided me with a prominent spot to display my jewelry. I do hope you’ll get a chance to stop by and tour the store — it’s brimming with beautiful designer clothes and accessories. Their summer sale is on right now, so be sure to check out the specials. The official launch for ArtWalk is this Friday evening from 7 to 8 pm at the Olds Museum. A special thanks to the Olds Uptowne Group who are sponsoring this event. Categories: Events | Tags: art show, artists, ArtWalk, Wellspring Visual ArtNetwork Association | Permalink. Southern Alberta is experiencing the worst flooding in recorded history. In Calgary, the province’s largest city, between 75,000-100,000 residents — about 10% of its population — have already been ordered to evacuate their homes and the city’s downtown core is undergoing mandated evacuation this afternoon. Roads and bridges are closed and entire residential and business areas are underwater. Towns and cities both upstream in the Rocky Mountains and downstream on the prairie are suffering unimaginable losses. The TransCanada Highway and the main rail line of Canadian Pacific are closed in several places because of washouts and landslides. And still the rain falls. The Arts Festival is being replaced by an Emergency Relief event. Anyone affected by the floods is invited to drop by Nose Creek Park on Main Street in Airdrie on Saturday, June 22 between 11 and 3 p.m. for free soup lunch and emergency food support. There will be music and children’s activities to help lift the spirits of families attending. For those who can, please donate non-perishable food and/or money for emergency funds. All money and food raised will go to Alberta provincial food bank associations to be distributed to areas most affected by the floods. Please know that the Airdrie Food Bank is not able to collect clothes and/or household items due to limited storage. Although the gravel road that connects us to the pavement is under water we live on high ground — we are safe and dry and much more fortunate than so many others today. There’s a lot to be grateful for. Categories: Events | Tags: art show, artists | Permalink. One of my favourite potters is David Todd of Otter Pottery. Working in two different styles — raku and barrel-fired pottery — he produces some absolutely stunning pieces. David and I are members of Wellspring Visual ArtNetwork Association. He’ll be at WVANA’s Fall Show & Sale demonstrating on the potter’s wheel. He’ll be making cups if you’d like to drop in and watch. And if you’d like to take a “turn” at handling the wheel he’ll gladly give you a hand. The Show & Sale is happening Saturday October 27 and Sunday 28 from 10 to 5 in Olds, Alberta. Here are directions. Categories: Events | Tags: art show, artists, Otter Pottery, pottery, Wellspring Visual ArtNetwork Association | Permalink. The ARTS Roundup Show & Sale was a great success — due in no small part to the beautiful location. Cam Clark Ford made its new Airdrie showroom available for the event on Friday night and all day Saturday. The spacious design and wraparound windows were a perfect backdrop for the artists to showcase their best works. The show and sale launched Friday night and the place was soon a-buzz with art lovers. The theme was western and many folks came dressed for the occasion. There was so much talent on display — one of the best shows I’ve been to in a while. Here are a few of the artists who took part. And as for me? I enjoyed the whole shee-bang. Visiting with other artists is always a plus, as is talking with buyers and browsers alike. And of course, seeing so many of my pieces go off to new homes. Categories: Events | Tags: art show, artists, ARTS Roundup | Permalink. Once again Airdrie, AB is home to a great art show and sale this September. It’s all part of ARTS Roundup, the kickoff to two weeks of visual and performing arts known as ARTember. The launch party happens Friday September 14 from 7 to 11 pm. And what a party! I was in the show last year and had a wonderful time. There’s a western theme to the evening event this year — gunslingers, card sharks, dance hall girls. And of course, refreshments. The old west was never quite like this! Although the Friday theme is western, the art is not restricted to that. You’ll find a broad array of styles and subjects for sale. More than 20 artists have also entered pieces into the silent auction taking place on Friday evening. You can view the pieces and see the minimum bids online here. Categories: Events | Tags: art auction, art show, artists, ARTS Roundup | Permalink. 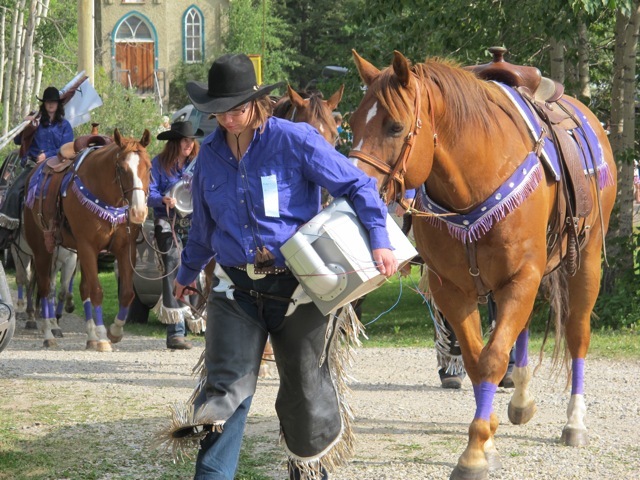 Last weekend Water Valley AB celebrated its annual Water Valley Days. The event kicked off with a parade. It’s not a big parade but folks don’t seem to mind. It’s filled with horses and young riders, floats promoting lawn tractor races and a music jam later that afternoon, clowns and old cars and whatever else happens to drive by. In short, a lovely cameo of life in rural Alberta. The day also included a series of demonstrations by several artists, me included. Painter and bronze artist Lesley Wolf displayed some of her work and explained how she goes from lumps of clay to finished statues. Diana Steer demonstrated an intriguing aspect of her art — painting on feathers. 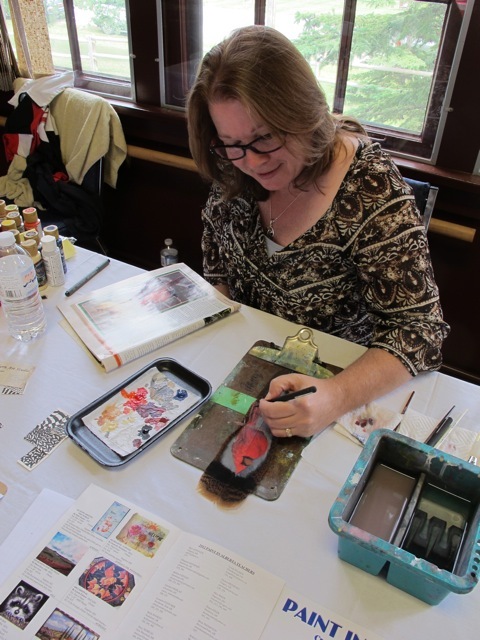 Several painters, a scrapbooker and another jeweler were also there. It was a wonderful chance for people to see artists at work and to talk to them about their art. A relaxing way to spend a warm summer day. Categories: Events | Tags: art show, artists, parade | Permalink.